We Watch As You Speak!! Bell & Ross is a Swiss watch company headed by French designers Bruno Belamich and Carlos A. Rosillo. The brand was launched in 1992, and the first watches were designed by Belamich and Rosillo and made by a German watchmaker, Sinn. They comprised a group of designers and specialists of aircraft and space controls joined with a set project: to create watches perfectly suiting a professional use. Their stated aim was to be part of the great Swiss watchmaking tradition while meeting the demands of men facing extreme situations. Typically Bell & Ross caters for 'professionals' within the armed forces and members of elite security organizations. Watches such as the BR Instrument have been designed to replicate the shape of a cockpit instrument taken from an aircraft. 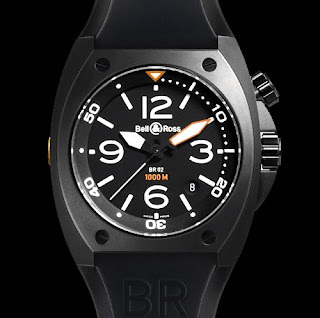 The BR02 range caters for diving professionals through the use of highly legible dials and cases water resistant to withstand 1000 metres of pressure. Another offering is the Hydromax; which contains hydraulic fluid within the case to counteract the effects of external pressures. The result is a watch water resistant to 11,100 metres. A more recent addition to the collection is the 'BRS' ceramic cases & diamond bezels for women, offering a scratch resistant case, elegant formal looks whilst still retaining the classic shape of the aviation themed BR Instrument range. Bell & Ross's first watches were virtual re-issues of Sinn models and carried the Bell & Ross logo as well as Sinn's. The partnership ended in 2002, when Bell & Ross began its own independent production in their facilities La Chaux-de-Fonds, Switzerland. Comes with box and warranty card. TAG Heuer has unveiled a new high-tech prototype watch to celebrate the 24 Hours of Le Mans race - the TAG Heuer MONACO 24 Concept Chronograph. The TAG Heuer MONACO 24 Concept Chronograph is inspired by the Le Mans endurance racecars and comes with a Calibre 36 movement that "floats" inside an oversized (40.5mm) black PVD-coated case, suspended within a steel-tube housing and visible through the dial face and the sapphire crystal caseback. The components of the TAG Heuer MONACO 24 Concept Chronograph are further protected by a new composite filter material that's used in auto racing. Custom built in industrial-grade tungsten, the three arrows of the oscillating weight echoes a GT car's chrome mags. The TAG Heuer MONACO 24 Concept Chronograph features the iconic blue and orange livery of Gulf Oil. The TAG Heuer MONACO 24 Concept Chronograph is water resistant to 100 meters and features an anti-reflective double-sided treatment on the curved sapphire scratch-resistant crystal glass. Pricing and availability have not yet been announced for the Monaco 24 Concept Chronograph. I expect it to be released next year, with a price tag of at least $10k. 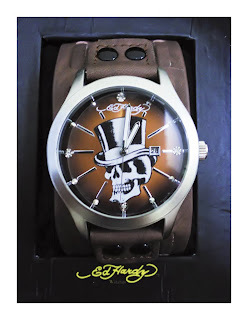 You can wear this exceptionally beautiful watch for only RM 500..grab fast! 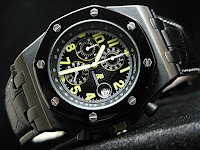 Audemars Piguet:The Luxury Is In Your Hand! The roots of Audemars Piguet date back to 1875, when the 23-year-old Jules-Louis Audemars met Edward-Auguste Piguet, then only 21, at Vallée de Joux, which is considered to be the cradle of prestige watch-making. Their hometown was Le Brassus. When they graduated school they went to Vallée de Joux to start working in their favorite field of watch manufacturing. Thus Audemars started producing component parts for movements and Piguet got the job of a repasseur, whose job it was to make the final regulation of the timepiece. They founded a firm later known as Audemars, Piguet et Cie.
Today the company, along with Patek Philippe and Vacheron Constantin, is sometimes claimed to be one of the top three Swiss watchmakers. Every timepiece manufactured in-house is still made using the old-fashioned hand-made technique. 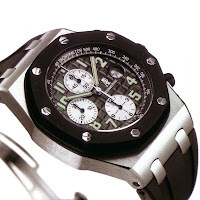 Like many other brands of luxury watches, Audemars Piguet has a number of ambassadors, such as Indonesian-French singer Anggun, Indian Cricketer Sachin Tendulkar and Malaysian actress Michelle Yeoh, as well personalities and teams in different sport categories such as cricket, softball, golf, skiing, motor sports and sailing. Octagonal Shape case are the mark of the Royal Oak Collection. More extreme than the previous design, Royal Oak Offshore comes with daring futuristic design,oversize cases and chronographs. We have both design in our vault. Serious buyer with is needed. Grab this elegant and flair watches, FAST! 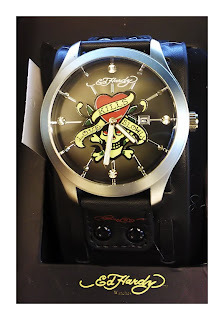 New Stock of Ed Hardy Watches! Only 2 Stock left from every set. Comes with box and warranty card. Please use the shoutbox.We will respond ASAP!! Inspired by many different subcultures and their respective iconography , his tattoo creations are a mixture of American, Japanese, Cholo, tattoo, surf and hot rod imagery; giving his designs a wide range of cultural appeal. 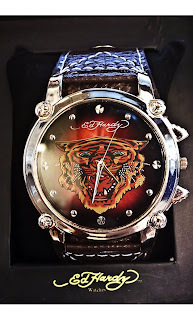 We sell replicas for various watches from famous and stylish name such as Ed Hardy, Breitling, Tag Heuer and many more. With a small price tag, even you can wear all this exquisite watches and even in the eye of the expert can't tell the different. We will renew our stock every so often, so catch up with flow of style and wear it!